RouteRank is a free online service that you may use to find the most ecological way of traveling from one place to another. Ever asked yourself if you should take the car, train or plane on your next holiday or business trip? Maybe you have even tried to calculate the traveling time and expenses for the various traveling options. Doing that manually can take quite some time. That's where the new web service routeRank steps in. RouteRank queries different traveling services like airlines or train companies to calculate the best way of traveling to a selected destination. The service display all results based on the cheapest possible price with the option to change the deciding factor to time, means of travel or CO2 emission. 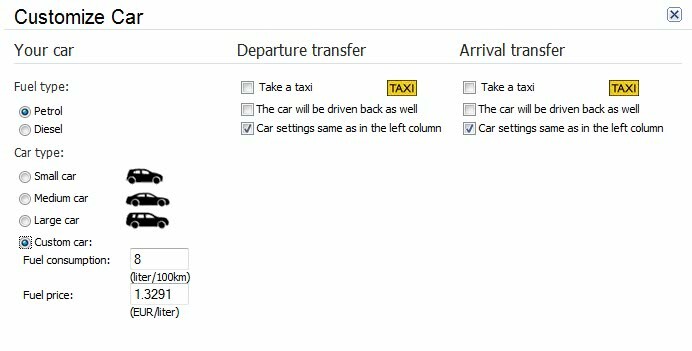 It will display the departure and arrival date for each travel option, and the number of legs for each means of transportation. The information offered by routeRank makes it very comfortable to find suitable means of travel. It is even possible to customize the car that you may be use for the trip (including petrol type, fuel consumption and petrol price), as well as the departure and arrival transfer means which will be included in the calculation. A quick sample route from Berlin, Germany to London, UK revealed the following: The most environmentally friendly way of traveling is by train with a CO2 emission of 57 kg, a traveling time of 10:15 hours, a price of 169,50 Euro and three legs. The fastest way is by plane which would cut the traveling time almost by half to 5:40 hours. The price would be 54,30 and the CO2 emission at 212 kg. Traveling by car would be the most expensive, longest and environmentally unfriendly way of traveling between the two locations. One interesting aspect here is that the service is considering the transfer to and from some of the locations. If you use one of the cheap airlines you usually do not arrive at the main airport at the destination but another airport that is sometimes badly connected to the city. RouteRank takes this into account. 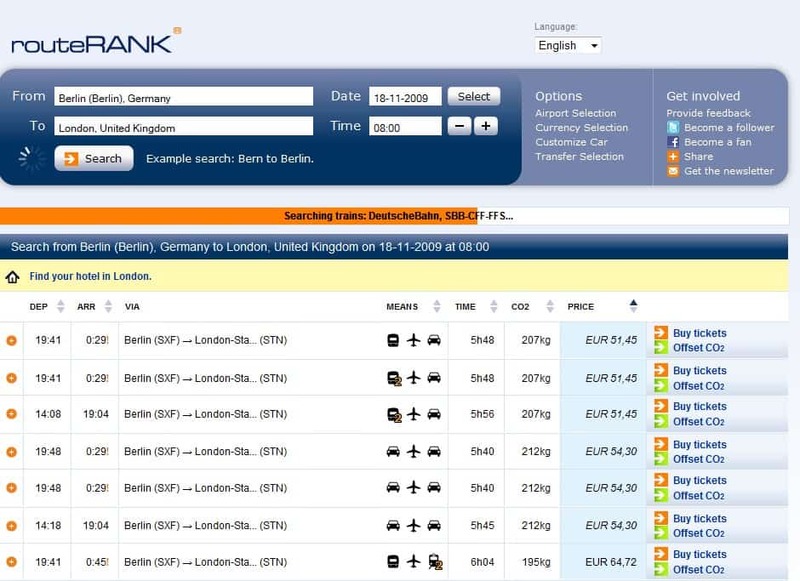 You may book plane or train tickets using the site as well. Links are provided to travel sites where you may buy the tickets. RouteRank is an interesting service for users who want to quickly see the best means of traveling between two locations based on important parameters such as traveling costs and time. It is also one of the few services that lists the ecological cost as well. I am a member of the routeRANK team and I’ve found this article thanks to some tweets. It is awesome. Thank you for spreading the word about our travel planning service. Nice service, tools like this are much needed.